Mobile rewards network Kiip has added a self-serve option for advertisers aimed at attracting more small- and medium-sized businesses to the rewards-based platform. The new tool will enable companies to create and manage campaigns that run in more than a thousand iOS and Android apps. The selling point of the Kiip network is to reach consumers with offers and discounts at what it calls “engagement moments,” such as when they are moving to a higher level in a gaming app, logging a workout in a fitness app, or completing a to-do list. “Think not just being there on a recipe app as a banner ad, but right there after someone bookmarks a recipe with an actionable reward that acknowledges they just did something significant,” wrote co-founder Brian Wong, in a recent blog post. Users then enter their email addresses to receive rewards such as a coupon or gift card. Three-year-old Kiip says timing offers to those moments of achievement has helped its network generate a 15% engagement rate compared to the industry average click-through rate of 0.4%. It claims that rate rises to 50% for users who have previously redeemed an advertised reward. After focusing initially on mobile gaming, Kiip has expanded its network to encompass categories including fitness, health, food and drink. The fitness category, for instance, has risen from a few dozen to almost a hundred apps, allowing marketers to target audiences more tightly within that vertical and other lifestyle areas. Kiip added a self-serve tool for developers last year to make it easier to integrate their apps with the advertising platform that reaches 75 million users globally each month. Along with long-tail developers, it now wants to open up its network to a wider range of advertisers. To date, Kiip has worked primarily with big brands like 7-Eleven, Amazon, Ford, Pepsi, Procter & Gamble, and Sony Music. “Self-serve is a natural fit for e-commerce businesses looking to sharpen their customer acquisition strategies. We’ve had initial rewards include product and shipping credits, giveaways, exclusive access and more,” said Kevin Fishner, product lead at Kiip. The company said it vets self-serve campaigns through a “quick approval process” to ensure quality control for developers. Initial advertisers in the self-serve program include Uber, 1-800-Flowers.com and Coastal.com, with others being added on a rolling basis. The new service, which the company says has no minimum buy requirement, is launching in 11 languages across Latin America, Europe, the Mideast, Asia and Japan. 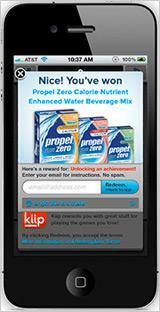 4 comments about "Kiip Debuts Self-Serve Option For Advertisers". James Epstein from MuteSix Agency, June 18, 2013 at 3:43 p.m.
Way to stay ahead of the trends MediaPost. PaeDae (PaeDae.com) has been 100% self serve for Developers for a while now. We have been working with them for the last 5 months on the developer side and are very happy with the eCPM's that we have been seeing inside of our games. The in-game reward space is growing for us and we are excited to test out similar services. Ann Murray from PaeDae, June 19, 2013 at 4:43 p.m.
Hi there, my name is Ann Murray and I’m PaeDae’s PR Director. Congratulations to Kiip for this great bit of news. They're a great company doing very cool things in the space. However, I wanted to just remind readers that PaeDae has been offering self-service options to brands and our ad agency partners for over a year. Thanks! Brian Wong from Kiip, June 19, 2013 at 10:37 p.m.
Ann, I think you are talking about self-service for developers, which Kiip announced in March last year (http://techcrunch.com/2012/03/01/kiip-self-serve-developer-fund/) This particular announcement is for brands. I noticed a "contact us" form on your website for brands? Ann Murray from PaeDae, June 20, 2013 at 10:54 a.m. Thanks for seeking clarification Brian! At PaeDae, we actually 'vet' all advertisers to keep prize quality up, but the system is self-serve, and has been for quite some time.